Flow or volume flow is the measurement of a quantity of flowing gas and is often given in the SI unit [m3/s]. The flow velocity is closely related to it. It is a measure for the velocity at which a medium flows and is usually given in m/s. 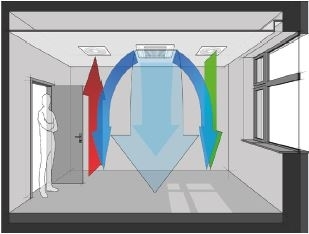 Heating, ventilation and air conditioning systems heat/cool by way of mass transmission, i.e. aeration. In short, the process involves heat transfer or energy transport. In order to design this transfer optimally for the operation of plants and to check it in the course of maintenance work, it must be ensured that the flow velocities in the ventilation ducts are correct. An optimally designed plant has the best-possible energy efficiency and can thus be operated economically. IS A CUBIC METER ALWAYS THE SAME AS A CUBIC METER? No! Of decisive importance for the quantification of the gas quantity being transported is the flowing mass. 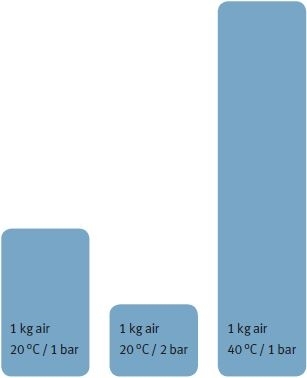 The volume of a kilogram of air is, however, dependent on the temperature and pressure. Various standards, e.g. ISO 1217, define what a cubic meter of gas is. To do so, data is calculated back to a reference gas temperature and system pressure to generate comparable measurements. Experts then talk of a standard cubic meter or standard volume. HOW DOES ROTRONIC MEASURE FLOW? Rotronic offers vane anemommeters for airflow measurement. These probes are especially suitable for medium flow velocities in ducts. When air flows through it, the rotor turns in proportion to the flow velocity and thus the volume flow. The Rotronic anemometers are designed such that the air resistance is kept to a minimum.